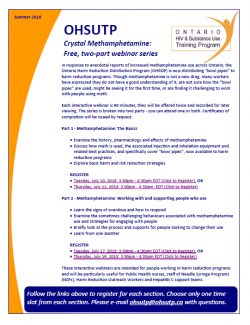 The Ontario HIV and Substance Use Training Program (OHSUTP) is offering a free, two-part webinar series on Crystal Methamphetamine. Follow the links above to register for each section. Choose only one time slot from each section. The sessions will be recorded. These interactive webinars are intended for people working in harm reduction programs and will be particularly useful for Public Health nurses, staff of Needle Syringe Programs (NSPs), Harm Reduction Outreach Workers and Hepatitis C support teams. Please e-mail ohsutp [at] ohsutp [dot] ca with questions. Click on the image to download the event poster. The Health Equity Impact Assessment (HEIA) Community of Interest invites you to its upcoming webinar, "Applying HEIA: Two Public Policy Case Studies." EENet presents Part 2 of New Narratives - a webinar series. The Canadian Institute for Substance Use Research (CISUR) and the Centre for Addiction and Mental Health (CAMH) are pleased to bring you this webinar, where they present findings from the Canadian Alcohol Policy Evaluation (CAPE) project.